We will use the ASP.NET Gantt Chart control from DayPilot Pro for ASP.NET WebForms package. CallBack handling type means the Gantt control will call the server-side RowCreate event using an AJAX CallBack. As soon as the users finishes entering the new row name the Gantt control will fire RowCreate event. We will come back to RowCreate event handler later, as soon as we connect the Gantt chart to a database. Read more about task creating [doc.daypilot.org]. The Gantt chart control will let you specify the field names and load the tree hierarchy from a flat data source. The Db.GetTasksFlat() method loads the flat task data. Read more about task loading [doc.daypilot.org]. In order to create a new task in the database, we need to add a handler for the RowCreate event. This Gantt_OnRowCreate event handler will create a new database record and refresh the view. The Db.InsertTask() method creates a new task in the database. We will use "null" as the parent id because the new task will be stored at the top level. 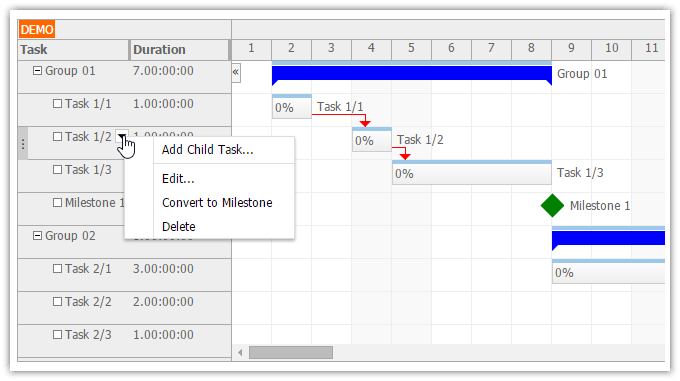 The Gantt control can display additional task data in custom columns. The columns will display data from a specified database field (Property). The column data can be further customized using BeforeTaskRender event handler. We will use it to display the task duration in the second column. Read more about Gantt columns [doc.daypilot.org]. When TaskMoveHandling property is set to "Notify" (default value) the Gantt chart updates the task position on the client side before firing the server-side event handler. This means it isn't necessary to reload all tasks in the TaskMove event handler. However, moving the task to a new position can affect the row header content generated using BeforeTaskRender. That's why we reload all tasks and request a full refresh of the Gantt Chart in Gantt_OnTaskMove method. Read more about drag and drop task moving [doc.daypilot.org]. When TaskResizeHandling property is set to "Notify" (default value) the Gantt chart updates the task start and/or duration on the client side before firing the server-side event handler. This means it isn't necessary to reload the tasks in the TaskResize event handler. Just as in case of EventMove, resizing the task can affect the row header content generated using BeforeTaskRender. That's why we reload all tasks and request a full refresh of the Gantt Chart in Gantt_OnTaskResize method. Read more about drag and drop task resizing [doc.daypilot.org]. The ASP.NET Gantt chart control supports drag and drop changes of the task hierarchy. A drag handle appears on the left side of the task header if the user hovers over its name. The user can select the target position using dragging. The Gantt chart will let them place the item before or after another item, or as a child. When the task is dropped the task will be moved to the new location. 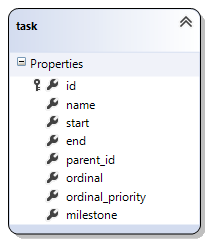 We will use two special database fields to store the task order in the database: [ordinal] and [ordinal_priority]. We will update the order after every row move and compact the sequence of [ordinal] values for every parent task. The [ordinal] field stores the task order for the same parent task (stored in [parent_id]). The [ordinal_priority] stores the last update date and time and is used temporarily during the reordering. It keeps the algorithm simpler. We also have to update the task loading method to use the [ordinal] field for sorting the tasks. Read more about drag and drop row moving [doc.daypilot.org]. The context menu items with Action="CallBack" will be handled on the server side using RowMenuClick event. By default the row context menu can be invoked using a right click. In order to provide a visual hint to the users we will add an active area to the row using BeforeTaskRender event handler. The context menu actions should be different for task groups and milestones. We will create a special context menu control for each task type. We will modify BeforeTaskRender again and assign the context menu depending on the task type. Milestone is a special type of task that can be used to mark a specified point in time. We won't let the users create the milestones directly - they are able to convert a new task to a milestone using a context menu. The Gantt chart supports links that show task dependencies. Common link types (Finish-to-Start, Finish-to-Finish, Start-to-Start, Start-to-Finish) are supported. Links can be loaded using Links property. 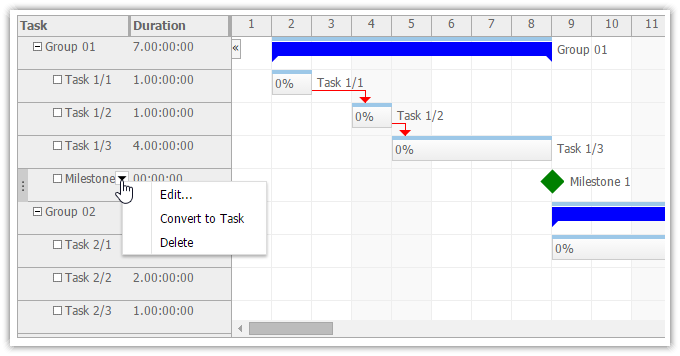 The Gantt control supports creating task links using drag and drop. This feature is enabled by default (LinkCreateHandling="Notify"). We need to create a LinkCreate event handler in order to create a DB record for the new link. The Gantt_OnLinkCreate updates the database. We need to reload the events on the client side. Although the link would be created on the client side in the default "Notify" handling mode it would have no ID associated to it. We will let the users delete links using a context menu. First, we will create a context menu control and link it to the Gantt control using ContextMenuLinkID property. The "Delete" menu item will fire LinkMenuClick event on the server side. Read more about link context menu [doc.daypilot.org]. The Gantt chart includes built-in support for displaying task progress. It is displayed graphically in the complete bar at the top of the task box. The task also displays the complete percentage as text in the task box. Read more about task percent complete [doc.daypilot.org].